The Super Eagles came from 2-0 down to beat Argentina 4-2 in Krasnodar, Russia, with Iwobi scoring Nigeria’s second and fourth goals. 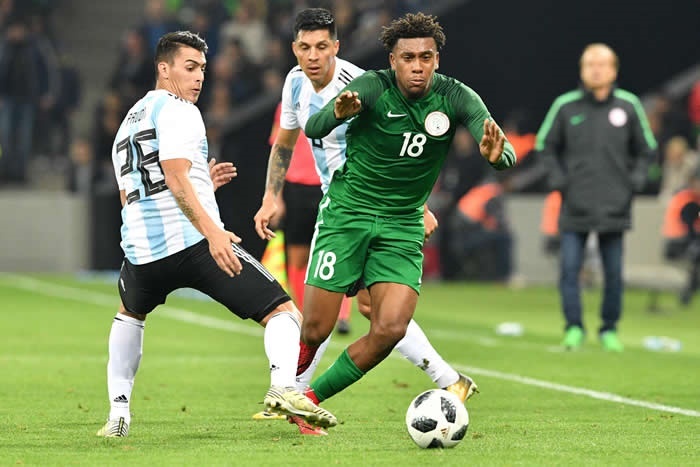 Scoring two well-taken goals against two-time world champions, Argentina is certainly not a mean feat and it is understandable that Alex Iwobi is over the moon; having helped Nigeria to the 4-2 victory in Tuesday's friendly . Iwobi who was very instrumental in helping Nigeria emerge as the first team to qualify for the Russia 2018 World is glad to have had a great week with the Super Eagles and he is now set for action with Arsenal. Meanwhile, Arsenal have hailed Iwobi and Alexandre Lacazette after they both scored twice for Nigeria and France respectively in Tuesday’s international friendlies. Other scorers for the Super Eagles were debutante Bryan Idowu and Kelechi Iheanacho who also provided two assists. Lacazette gave France the lead twice against Germany in Cologne but they could only settle for a 2-2 draw. “Alex Iwobi scored twice as Nigeria came from 2-0 down to beat Argentina 4-2 in Krasnodar,” Arsenal wrote on their official website.